WCM-Q conference discusses how lifestyle medicine can change lives. 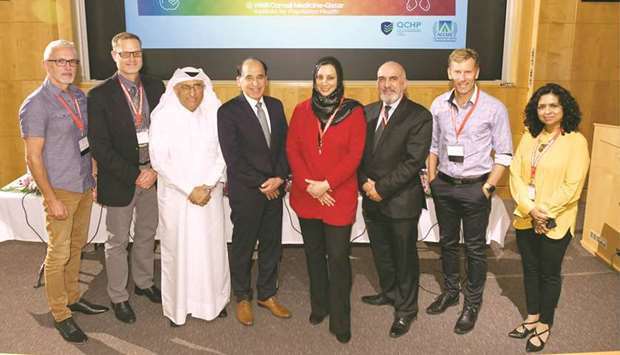 The importance of lifestyle in preventing, treating and even curing illnesses like diabetes and heart diseases was discussed at the latest conference at Weill Cornell Medicine – Qatar (WCM-Q). ‘Lifestyle Medicine: An Emerging Healthcare Trend that Inspires’ brought together experts from across the world to discuss the latest trends, share data about the impact that lifestyle changes can have to an individual’s health, and explore best practice among clinicians. Organised by WCM-Q’s Institute for Population Health, delegates learned how to evaluate a patient’s health with reference to their lifestyle habits, how to guide patients in their habits and how to develop nutrition and exercise regimens. Speakers included international experts in lifestyle medicine, such as Dr Wayne S Dysinger, CEO of Lifestyle Medicine Solutions, Dr Darren Morton of Avondale College of Higher Education in New South Wales, and Dr Ahmad al-Mulla, senior consultant in public health and adviser to the Minister of Public Health, who delivered the keynote speech. Delegates to the two-day symposium were also able to take advantage of a number of workshops including ‘Nutritional Mythbusters’, delivered by Stephan Herzog, executive director of the American and International Boards of Lifestyle Medicine and ‘How to Take Care of Ourselves’ led by Dr Mohamud Verjee, associate professor of family medicine in clinical medicine at WCM-Q. In a lecture entitled ‘The Promise of Lifestyle Medicine’, Dr Ravinder Mamtani, senior associate dean for population health, capacity building and student affairs at WCM-Q, extolled the potential of behavioural changes to vastly reduce the number of cases of chronic diseases like diabetes and heart disease. Dr Mamtani explained that only around 15-20% of a person’s health can be attributed to medical therapies and treatments; the remaining 80-85% is due to lifestyles and behavioural and socio-economic factors. “It’s not cancer and heart disease that kill people but poor nutrition and a lack of exercise; the real killers are poor lifestyle choices. I am not belittling medical care, but health professionals are missing the point about the importance of lifestyle, and we have been missing the point for a long time”, noted Dr Mamtani. In his lecture entitled ‘Lifestyle Medicine, Nutrition and Chronic Diseases: Time to Reverse an Epidemic’, Dr Wayne S Dysinger outlined how lifestyle changes can actually cure many chronic illnesses, including conditions that were previously thought incurable, like type-2 diabetes. He also debunked myths about low-carbohydrate, high-protein diets that have become popular in recent years as a method for losing weight, stating that for the vast majority of human history, complex carbohydrates formed the bulk of a person’s diet. The conference also featured a poster session, presenting findings from the latest research on lifestyle behaviours. Topics included the management of gestational diabetes through lifestyle, the awareness of health professionals to sleep hygiene, and the prevention and treatment of tobacco use.